PAWS (Pet Away Worry & Stress) sessions feature registered therapy animal teams—including dogs, bunnies, chickens and other therapy animals. Sessions are FREE and open to the University of Minnesota community. 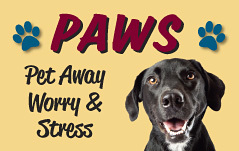 You can Pet Away Worry & Stress at several locations on the East Bank, West Bank or St. Paul campuses Monday through Thursday during spring and fall semesters. St. Paul Student Center: Tuesdays, 1–3 p.m.
Boynton Health: Wednesdays, 2:30–4:30 p.m.
West Bank: Locations vary, Thursdays, 11:30 a.m.–1:30 p.m.
Add the PAWS calendar to your calendar by clicking the plus (+) icon above. For many young adults, entering college and being away from home often means saying goodbye to their pets. 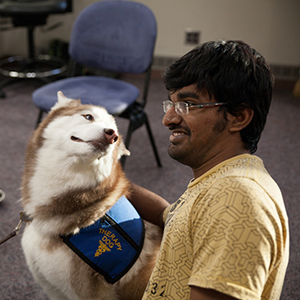 Boynton seeks to provide Animal Assisted Interactions (AAI) in its continued effort to meet student needs, especially in the areas of stress reduction. AAI teams are volunteer handlers who are specially trained and evaluated, along with their animal partners. Now you can Pet Away Worry & Stress at your place. Get more info or request a PAWS session to visit your University group or event. Questions about PAWS? Contact Tanya Bailey, PAWS Coordinator at tanya@umn.edu.